And why are an increasing number of progressive organizations working on building a so-called corporate coaching culture? And what does that mean and why do they do that? Finally, if I want to transform the culture of my organizaton towards a purposeful success culture, how should we go about it? On this page, we give some initial answers to these questions. Please do contact us if you would like to have a conversation how you could go about building a purposeful success culture. A simple and concise definition of corporate culture is "The way we do things around here." coined by Deal/Kennedy in 1982. Ultimately, any organization wants to be successful with success being defined by them. In order to achieve the desired success, leaders need to determine useful strategies that are likely to lead - if well executed - to the desired outcomes. There is ample evidence that good strategy execution is more critical than the quality of the strategy. A mediocre strategy well executed tends to lead to better results than a great strategy poorly executed. So the quality of strategy execution depends on the quality of behavior of all stakeholders which is guided by the organizational culture. 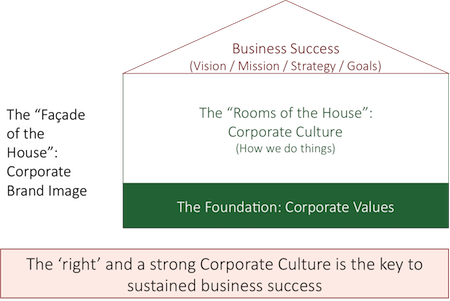 The metaphor of a house illustrates the connections between corporate culture, brand image, values and vision/mission/strategy. What is Corporate Coaching Culture? A corporate coaching culture means that coaching (mindset, practices, etc.) has become an integral part of the organizational culture. 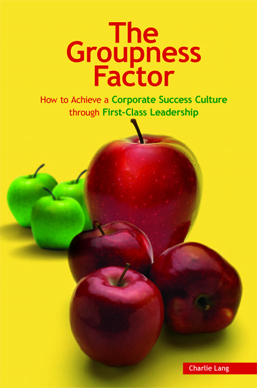 As such, corproate coaching culture is an aspect of the whole corporate culture, but usually doesn't fully describe the culture of an organization. Besides having a pervasive practice of coaching (receiving coaching, practicing coaching as a leadership style, team coaching, etc. ), a coaching culture is also marked by high levels of empowerment, focus on individual growth and development and accountability. The emergence of Generation Y (and soon Gen Z) combined with global trends such as VUCA (volatility / uncertainty / complexity / ambiguity), organizations are increasingly forced to rethink their leadership and organizational culture if they want to succeed in the 21st century. 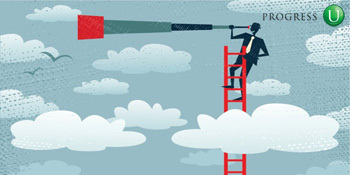 The huge challenges organizations face in attracting, engaging and retaining top talents are closely correlated with outdated corporate cultures and leadership. We found that traditional cultures and leadership served well the paradigms of the Industrial Age but is more than suboptimal in the emerging Knowledge/Information Age. A coaching culture addresses these new paradigmes much better than the traditional more hierarchical cultures. Our research on the state of Corporate Coaching Culture in Asia indicated that most organizations in Asia do not (!) deploy a very systematic approach to transform their organizational culture. There is more of a 'hit and miss' approach with numerous individual activites, hoping that these activities will lead to the desired culture change. Progress-U developed a systematic 8-step approach to corporate culture transformation that assists organization in creating the culture that is most likely to enable a great execution of their strategy. Contact us to see how we might be able to support you in the best possible way.